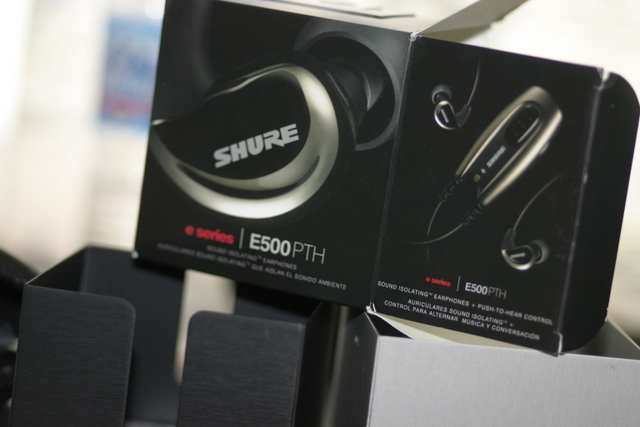 It's clear from the onset that Shure took strides to insure that the E530PTH made a powerful statement with regard to quality and durability from the moment the packaging is handled. In contrast to previous earbud (E3c, E4g) packaging, which comprised a plastic case, the E530PTH comes in a surprisingly compact square package which reminded me slightly of the box that iPods come in. Let's unpack this thing. 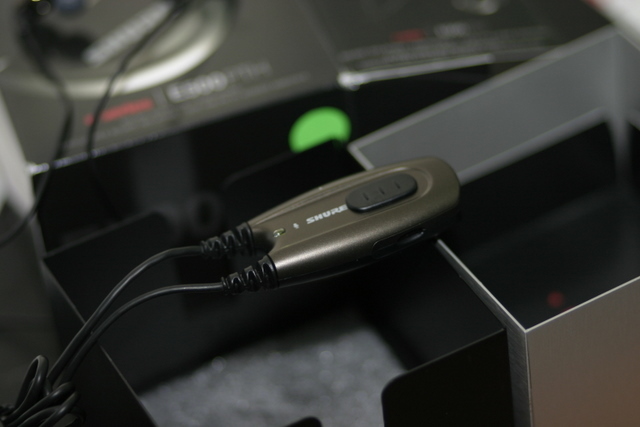 A brushed metal box attests to the quality and image that Shure wants to project with their top-of-the-line offering, the E530PTH. Cool? Yes. Surprise? No. At around $500 a pop, these phones should and do make a positive first impression. Note: While the package reads E500PTH, the name has since been modified to be E530PTH. The product is identical. 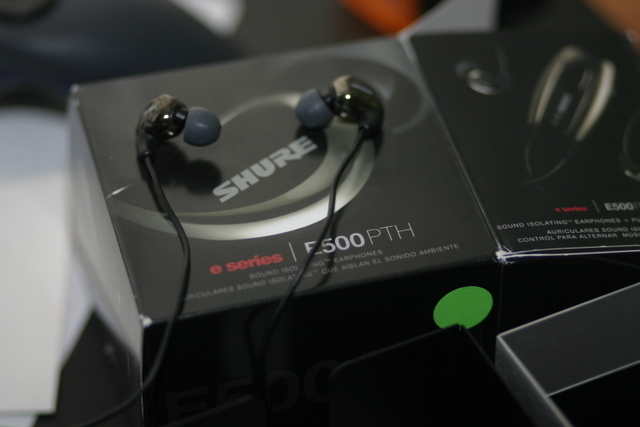 The E530PTH earbuds were slick and lightweight. With a glossy black shell and rounded wedge-shaped design, each earbud exuded style. Housed in each bud is some heavy duty machinery: three distinct speakers comprising two woofers and one tweeter. This triple driver design provides optimal audio quality over a range of sounds. The 'PTH' part of this package's namesake refers to the push-to-hear module. I'm not positive what drove Shure to spend development time and capital to produce this bit of machinery, but the module is useful if frequently taking your earbuds out would become irritating. The real heart of these earbuds, and what sets them apart internally from the wealth of canalphones out there, is Shure's three driver design. Housed in each earbud is a combination of two woofers and a tweeter (a feature usually nonexistent in the E530PTH's price range). Enhanced with integrated passive crossovers, this melding of ultra sensitive hi-tech audio reproduction gadgetry works to insure that highs and lows are reproduced with stunning clarity and power. On the outside, the E530PTH earbuds are slick and lightweight. With a glossy black shell and rounded wedge-shaped design, each earbud exudes style and quality. The included zip-up travel case also provides a convenient case in which to store the earbuds when they are not in use. Extra sleeves comprising various sizes and forms are included in order to ensure that a near-perfect fit is possible for anyone. The last piece worth mentioning in this section is Shure's 'PTH' module. It stands for push-to-hear, and is an attachment that eliminates the necessity of removing the earbuds when you want to hear what's going on in the outside world. I never had a problem just taking out my earbuds, so I found this attachment to be of minimal use, but for those whose ears would get irritated with continued removal and insertion of the earbuds, the PTH is a fine solution to your problems. It's designed to be very lightweight, and styled in black to match the rest of the package. A clip makes it easy to carry the module on your pants or shirt. The only gripe I have with the PTH module (besides the fact that I don't really need it) is that the sound dial to control microphone volume is a little difficult to access.